The JWST space observatory will consist of a telescope and its four associated scientific instruments, along with the giant sun shield (shown in blue). NEW YORK - A life-size model of a huge new space observatorybilled as the successor to the Hubble Space Telescope is taking on the BigApple this week at the World Science Festival. The gigantic telescope model ? roughly the size of a tenniscourt ? will be on display at New York City's Battery Park from Tuesday throughSunday, June 6. The actual James Webb Space Telescope is slated to launch in2014. "The Webb is the world's nextgreat space telescope, and is the scientific successorto the Hubble," said Sally Koris,spokeswoman for Northrop Grumman, the company contracted by NASA to build thetelescope." The full-scale model on display is constructed mainly ofaluminum and steel, and weighs 12,000 pounds (5,400 kg). It measures about 80feet (24 meters) long, 40 feet (12 meters) wide and 40 feet (12 meters) tall. 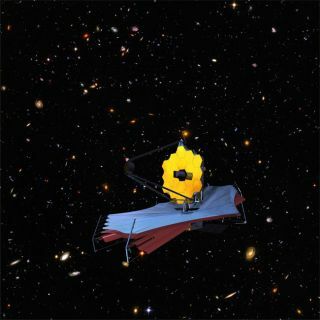 The JamesWebb telescope will observe the universe in long-wavelength infrared lightto peer at the most distant objects in the universe, beyond the reach of groundbased telescopes or the Hubbleobservatory. It will study the origins of stars and galaxies in the universe,as well as a host of other cosmic questions. The World Science Festival opening ceremonies, which arefree and open to the public, will take place on Tuesday at 11 a.m. EDT (1500GMT). Speakers will include NASA deputy administrator Lori Garver, along withDave DiCarlo, vice president of Northrop Grumman Aerospace Systems, BrianGreene, festival co-founder; and Warrie Price, president of Battery ParkConservancy. The festival is a week-long program in New York featuring 40events on a range of scientific topics hosted by luminaries across many fields. "The World Science Festival is a great opportunity forpeople to get a look at, and learn more about, the future of astronomy fromspace," said Eric Smith, NASA's Webb program scientist. "The Webbtelescope full scale model dramatically highlights how far the next generationof spacetelescopes will be from its predecessors. It?s unlike any telescope you?veever seen." The observatory, a NASA-led international collaborationbetween 15 countries, was named after NASA's second administrator James E. Webb.Northrop Grumman has been working on the telescope since 2002. "This is a very complexinstrument," Koris told SPACE.com. "We had to develop 10 newtechnologies in order to be able to build thisinstrument." The Northrop Grumman-built mock-up required two trucks toship it, and a 12-person crew about four days to assemble. The model will also belit up from its base so that it is visible at night.